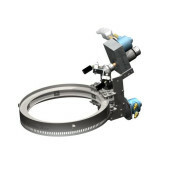 Air-powered rotation and drive for consistent and efficient operation up to 40,000 psi (2750 bar). 14 in. (350 mm) cleaning path. 8 jet head. Vacuum recovery. 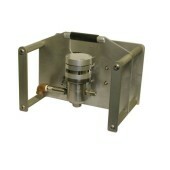 Specifically designed for cleaning auto plant paint grates. 40,000 psi (2750 bar) operation. Air-powered rotation. 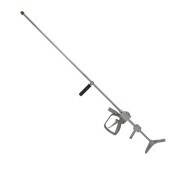 17.5 in (444 mm) cleaning path from 6-arm spray bar with adjustable jet angles. 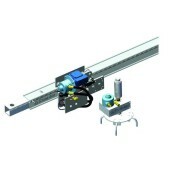 Mechanized linear motion with independent speed and rotation controls. 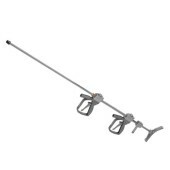 With a variety of swivels and rotary power options, the Blastrack can be configured for to almost any surface cleaning application. 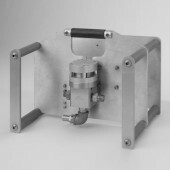 Mechanized circular motion with independent speed and rotation controls to handle round surfaces like pilings and pipes with custom made tracks to suit specific applications. 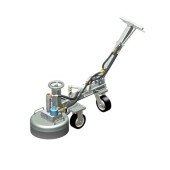 Self-rotating floor cleaner and surface preparation machine. 15,000 psi (1000 bar). 24 in. (610 mm) cleaning path. 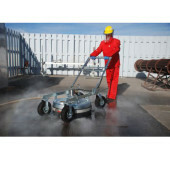 Self-rotating floor cleaner and surface preparation machine. 20,000 psi (1400 bar). 24 in. (610 mm) cleaning path. 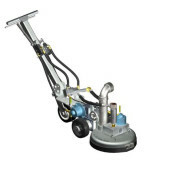 Self-rotating floor cleaner and surface preparation machine. 15,000 psi (1000 bar). 24 in. (610 mm) cleaning path. Vacuum-ready. 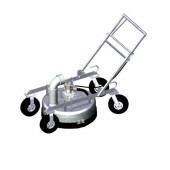 Self-rotating floor cleaner and surface preparation machine. 20,000 psi (1400 bar). 24 in. (610 mm) cleaning path. Vacuum-ready.